HARS is approved to provide amateur training for foundation and intermediate levels. If you are interested in either of these training courses please send your details via the following email and we will get back to you. Contesting (sometimes referred to as Sport Radio) is a great way to advance your station and operating skills. It also turns an often very quiet band into one that is buzzing. Vist our contests page to find out more. As you have visited these pages the chances are that you are interested already in radio and communications. Find out when you can access our radio nets which operate in various modes, including Voice, CW and many more. H.A.R.S Commercial Adverts Including Engineering and Employment. Here you can find out more about our great committee, their roles and how you can get in touch with them. An Amateur Radio Club for Hereford was started as far back as 1947, becoming Hereford Amateur Radio Society twenty years later in 1967. The club continues to flourish and there are at present over 40 members. Recently the club has been actively involved with contests, organised talks and social gatherings. The monthly club nights are regularly supported by Amateur Radio enthusiasts from varying walks of life and backgrounds offering a valuable source of advice on all aspects of radio communications. INTERESTED IN GETTING A TRANSMITTING LICENSE? 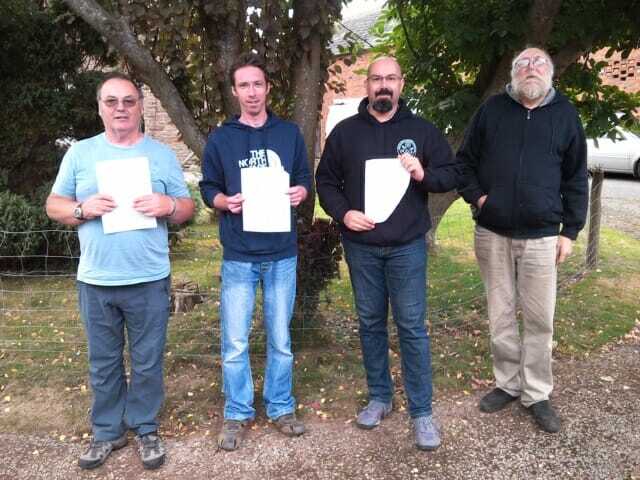 Following a two-day Foundation Licence Course over the weekend of 8th and 9th September the four candidates Paul, Richard, Leon and Keith were rewarded with a pass and so can now eagerly await their documents from the RSGB and apply for their licence. Once again the HARS Training Team were on site at the Clubrooms to deliver the course. In November the Team will be running an Intermediate Licence Course over three Saturdays and a Sunday and there is already a contingent of previous FL candidates who are enrolled on the course. Watch this space for further details or apply now and register an interest via the “training” button on this site.